TWIN SOLILOQUIES: Separated by the north Atlantic, two major productions of South Pacific are drawing rave reviews and nightly ovations this season... Since the fall, Michael Nouri and Erin Dilly have led a U.S. National Tour, presented by Barry and Fran Weissler in association with Clear Channel Entertainment, directed by Scott Faris with Jerry Zaks as production consultant; upcoming cities this spring include Nashville, Baltimore, Milwaukee, Philadelphia, New Haven, Seattle and San Diego...In mid-December, South Pacific came to the South Bank when the Royal National Theatre premiered a new production in London, directed by Trevor Nunn, with musical staging by Matthew Bourne, designed by John Napier...Philip Quast and Lauren Kennedy head this cast, scheduled for a limited run in the Olivier Theatre through April; for more information, visit www.nationaltheatre.org.uk. DEAR OLD SYRACUSE: Rodgers & Hart's rollicking riot of a musical comedy, THE BOYS FROM SYRACUSE, will return to Broadway for the first time in nearly 65 years with a new production from the Roundabout Theatre Company starting performances at the American Airlines Theatre in late July...Nicky Silver (RAISED IN CAPTIVITY, THE FOOD CHAIN) has written a new book based on the George Abbott original (by way of the Bard, of course), and Scott Ellis will direct...Visit www.roundabouttheatre.org for further details.SHALL WE DANCE? : The dance world is responding to invitations from this Organization to explore the music of Richard Rodgers in his Centennial year and beyond (see previous issue), with new works set to his music...As part of his company's fall season at New York's City Center in October, Lar Lubovitch premiered a new pas de deux entitled ""My Funny Valentine,"" arranged for piano and cello by Marvin Laird... Jennifer Muller and Frances Patrelle are among the leading choreographers now exploring the Rodgers songbook for original dance pieces; Dutch National Ballet, Ft. Worth/Dallas Ballet, Columbia City Ballet, Nevada Ballet Theatre, James Sewel Ballet, Oregon Ballet Theatre, Colorado Ballet, River North Ballet and Ballet Pacifica are among the companies that have committed to new Rodgers ballets in their upcoming seasons... Interested dance companies should contact our Centennial Dance Consultant, Ann Marie de Angelo, at annmarie@dangeloproductions.com. PORTRAIT OF THE ARTIST: People Magazine called it ""a high-class profile""...Newsday hailed it as ""an extraordinary achievement...as memorable and moving as any musical drama you will see and hear anywhere, Broadway included""...In November on PBS, WNET New York's AMERICAN MASTERS series premiered a two-hour documentary, Richard Rodgers: THE SWEETEST SOUNDS (see previous issue), produced and directed by Roger Sherman, written by Laurence Maslon, with Susan Lacy as executive producer... Calling it ""one of the most edifying television events of the year,"" the Washington Post's Tom Shales reflected, ""One can assume, or at least hope, that [it] will have a long afterlife on video""...Mr. Shales and others can now order the home video or DVD edition of THE SWEETEST SOUNDS by calling toll-free 1-800-336-1917. FREE TO DO FREE TO BE: Renewed interest in the revue FREE TO BE...YOU AND ME was sparked by a successful tour of the NYC public school circuit by INSIDE BROADWAY last season; a recent rebroadcast of the landmark 1972 television version conceived by, and starring, Marlo Thomas ""and Friends""; and a November '01, one-night-only benefit performance by New York's Drama Dept. that featured its own all-star cast of friends, including Ana Gasteyer, Isaac Mizrahi, Cynthia Nixon, Karen Ziemba, B.D. 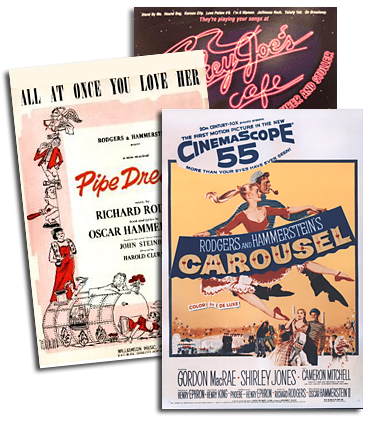 Wong, Kevin Chamberlin, Jackie Hoffman and Mary Testa...The R&H Theatre Library licenses FREE TO BE, which features a score by, among others, Sheldon Harnick, Mary Rodgers and Ed Kleban. I COULD WRITE A BOOK: On the eve of the Rodgers Centennial, Knopf published the long-awaited biography, SOMEWHERE FOR ME, by Meryle Secrest, hailed by the New York Times as ""a thorough and scrupulously researched biography that is both welcome and necessary""...Coming up: THE Richard Rodgers READER (Oxford University Press), edited and introduced by Geoffrey Block, comprised of more than 50 readings on, about and, in some cases, by Richard Rodgers...GETTING TO KNOW YOU (Harper Collins), a charming collection of lyrics from R&H songs illustrated by award-winning artist Rosemary Wells...STAGING South Pacific, by Robert Butler, a behind-the-scenes look at the current RNT production (NT Publications)...Revised, soft-cover editions of Rodgers' MUSICAL STAGES: AN AUTOBIOGRAPHY (DaCapo); OK! THE STORY OFOKLAHOMA! (Max Wilk, Applause Books); and RODGERS & HAMMERSTEIN: THE SOUND OF THEIR MUSIC (Frederick Nolan, Applause Books)... Also recently issued in paperback: THE BROADWAY SOUND: THE AUTOBIOGRAPHY AND SELECTED ESSAYS OF Robert Russell Bennett, the famed orchestrator of Broadway's golden era, edited by George Ferencz (University of Rochester Press)...Three Irving Berlin songs are each becoming illustrated books from Harper Collins - GOD BLESS AMERICA, illustrated by Lynn Munsinger (June '02), EASTER PARADE (Lisa McCue, February '03) and White Christmas (Greg Shed, September '03)...In the works for later this year is White Christmas: BIOGRAPHY OF AN AMERICAN SONG by Jody Rosen (Scribners)...Two lavish new books chronicling a century of theatre each feature the musicals of Rodgers, Hammerstein, Hart and Berlin - BOSTON'S COLONIAL THEATRE, by Tobie S. Stein (Colonial 2000 Ltd.), and THE SHUBERTS PRESENT, by the curators of the Shubert Archives (Harry N. Abrams)...Ethan Mordden's popular, non-consecutive decade-by-decade study of the American musical has just added the '60s to its roster with OPEN A NEW WINDOW (Palgrave), featuring Mordden's musings on such musicals as Mr. President, No Strings and Do I Hear a Waltz? CAREFULLY TAUGHT: With increasing frequency, academics are turning their attention to 20th Century musicals and popular songs - the above mentioned Geoffrey Block, Professor of Music History at the University of Puget Sound, is preparing a biography of Richard Rodgers for the inaugural volume of the ""Yale Broadway Masters"" series (2003); Jeffrey Magee, Assistant Professor of Musicology at Indiana University's School of Music (and author of the article, ""Irving Berlin's 'Blue Skies': Ethnic Affiliations and Musical Transformations"" in the Winter 2000 issue of Musical Quarterly) is preparing a biography of Berlin for the Yale series; and Christina Klein, Professor of Literature at M.I.T. has written COLD WAR ORIENTALISM: THE SENTIMENTAL CULTURE OF U.S. GLOBALIZATION (University of California Press, 2003), a study of '50s American perceptions of Southeast Asia as shaped by, among other influences, novels by Michener and musicals by Rodgers & Hammerstein. NEVER WALK ALONE: The first telecast of the PBS Rodgers documentary, THE SWEETEST SOUNDS (see p. 2) aired on Sunday night, November 4; on the East Coast it coincided with the Emmy Awards, which meant that viewers with especially impeccable timing, and equally nimble remotes, could watch the conclusion of the PBS program, featuring Louis Armstrong's rendition of ""You'll Never Walk Alone,"" and then flip over to CBS and catch Barbra Streisand singing the same song at the same time as the surprise finale of the Emmys...A double-plug for R&H's timely anthem, and the closest thing to a Barbra-and-Louis reunion since they filmed HELLO, DOLLY! together.